Increasing demands on the child protection system in the context of current fiscal constraints has led to a growing debate as to how scarce resources can be used to best effect. This overview report provides a summary of key findings and lessons from five detailed research papers, which have been published separately. 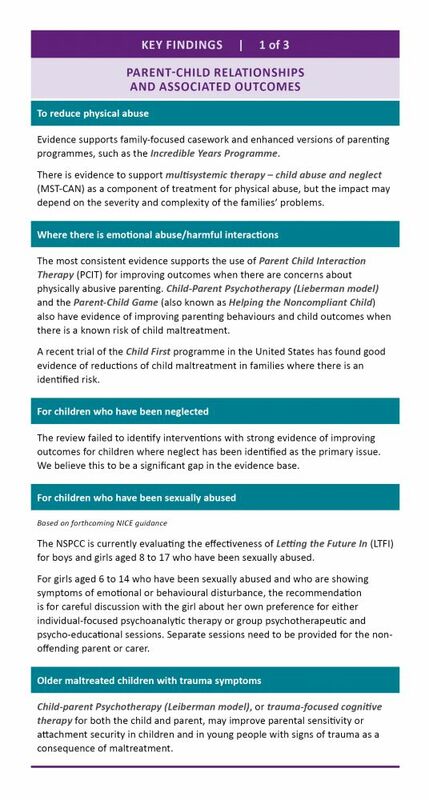 This overall project has been a collaboration between EIF, the LGA and the NSPCC, with support from Research in Practice (RiP) and the Department of Social Policy and Intervention at the University of Oxford. What does the evidence tell us about what is effective? The review of evidence published as part of this project has identified interventions that have been shown through robust studies to be effective in improving outcomes for vulnerable children. At a time of shrinking budgets and increasing demand, it seems particularly important to use the evidence to ensure scarce resources are directed towards interventions with the greatest chance of success. While evidence of impact is not the only consideration in deciding what to deliver, on balance, families and children who receive interventions shown through robust methods to improve outcomes are more likely to benefit and to a greater degree than those who receive other services. This evidence provides an important new resource for local authorities. Evidence of effectiveness is important, but is not the only consideration in making decisions locally about what to commission. Factors such as cost and fit with the wider local system are also important. Making final decisions about specific interventions that could be delivered should be done by assessing potential interventions for both their feasibility and acceptability within the local context of resources and priorities. It is also important to consider how far any new evidence-based intervention is likely to provide measurable value over and above the current provision. Local authorities included in the research were delivering some of the services highlighted by the evidence review as being effective. 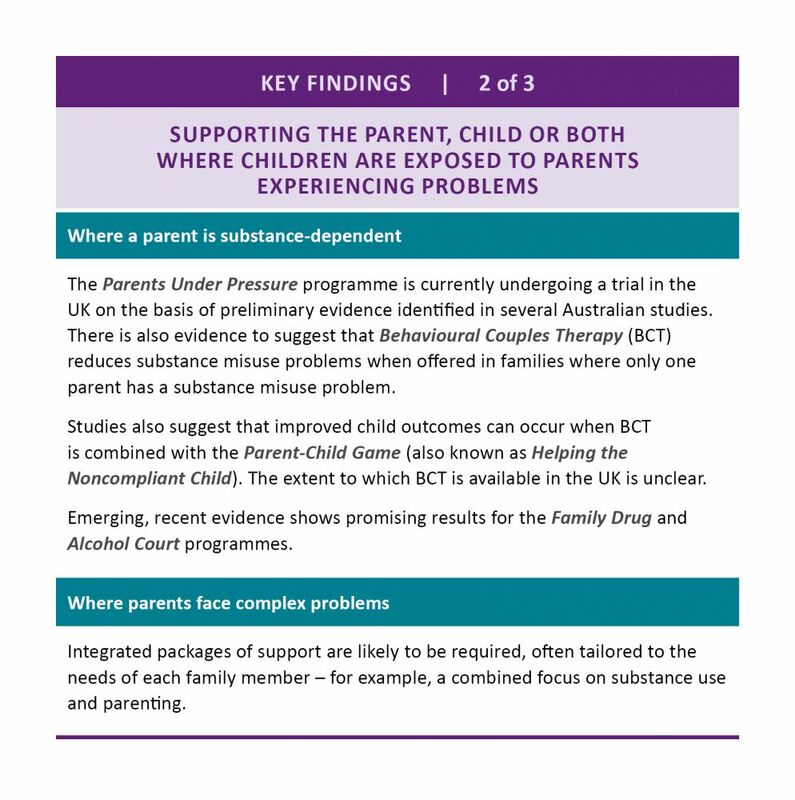 While this is very positive, it was not clear how far these services were available to all those families who might need them, or to what extent there were families and children with needs for which there are not well-evidenced interventions available. This highlights the significant gap between what is known to be effective from peer-reviewed studies and what is delivered in local child protection systems. This work also highlights the extent to which approaches described in the evidence review as ‘innovative but not yet evidenced’ are being widely delivered. Reducing the distance between the worlds of evidence and local decision-making will require a variety of bodies to work collaboratively to communicate and develop the evidence, to support local areas to use that evidence, and to develop ‘evidence literacy’. The government intends to establish a new What Works Centre for Children’s Social Care, which provides an important opportunity to create the central infrastructure to respond to some of these issues. It will be important that questions of ‘what works’ and outputs from the centre are sufficiently nuanced to guide local authorities to apply the evidence in varying strategic and operational contexts. Communicate the nature of the evidence for child protection to local leaders and commissioners, including which activities are supported by good evidence, which activities are harder to evaluate, and where the gaps are. Guide local decisions by providing clear information about which approaches are likely to provide the most effective help and protection and those that have yet to demonstrate impact on outcomes for children. It is important to ensure that the way evidence is presented helps to build awareness of why evidence matters and makes clear to practitioners how the evidence in question can underpin professional judgment and direct work. 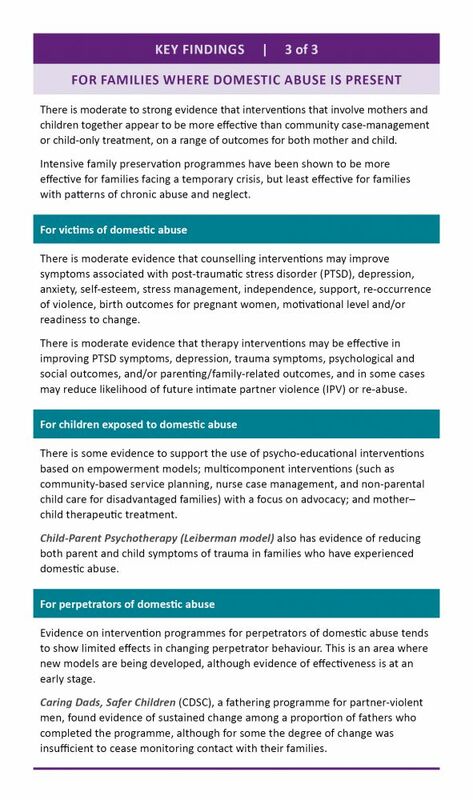 This work highlights some clear gaps and issues in relation to the available evidence that need to be addressed by all those with an interest in ensuring child protection work is informed by evidence. This includes ensuring that evidence of impact is developed for some of the widely used approaches where it is not yet available. This information should also include detail about the costs of delivery and cost–benefit analysis, to help other areas develop business cases. It should also be a priority to conduct robust evaluation of some of the ‘innovative but not yet evidenced’ multi-disciplinary approaches to assessment and delivery which are widely used, such as multi-agency safeguarding hubs (MASH). Action is needed to develop the analytical capacity in children’s social care to understand the nature of their local demand and apply the evidence as it relates to leadership, commissioning and practice. Government, in close partnership with the sector, has an important role to play in providing assistance or capacity in local areas that have had to reduce own their internal capacity for evidence appraisal and data analysis.